Yes, you read it right. The Roof Garden - known as the Hannover’s largest beach style rooftop bar - is now open also in winter as an indoor location with heating system. As it is also LATIN night at the roof garden, we will have the chance to dance SALSA, BACHATA and REGGAETON at our event night startig from 21:30 onwards. Please try to arrive earlier than 21:30 to our event. 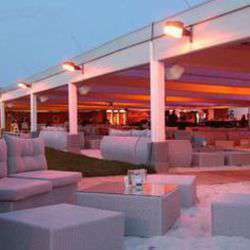 We will for sure meet there for networking, socializing, and enjoying a nice evening. Albatross Members enter for free, and early birds will receive a free welcome drink. Please register for this event by clicking the Attend button. Feel free to bring your international friends and co-workers, and don’t forget to invite them to sign up for InterNations, too! The guest will be closed around 17:30 on the day of the event. We are looking forward to seeing you!